The main goal of the periodontal therapy is the regeneration of the affected periodontal structures and achievement of stable periodontal attachment. The contemporary statement regarding the effectiveness of the periodontal therapy is that healing results with more coronal level of the connective tissue attachment are associated with better long term stability. 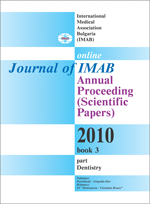 Aim: Evaluation of the effectiveness of treatment of severe chronic periodontitis with additional target antibiotic administration in comparison with the therapy with adjunctive antimicrobial combination amoxicillin+ metronidazole and conventional mechanical periodontal treatment regarding the mean clinical attachment gain, reduction of the attachment loss extent and the variations of the attachment level in sites with initial CAL from 1-2mm, from 3-4mm and above 5mm. Results: In all study groups mean clinical attachment gain has been achieved after the non-surgical periodontal therapy. In the group with target antibiotic administration the highest reduction of periodontal sites with CAL above 5mm is reported. Key words: periodontitis, adjunctive antibiotic therapy, target antibiotic administration, clinical attachment level gain, long-term maintenance. 2. Djemileva, T. Periodontal diseases. Azer Sofia, 1999, 367p. 9. Popova Chr., K. Kotsilkov. Effectiveness of the additional anti­microbial treatment in comparison with mechanical cause-related therapy of chronic periodontitis. Zabolekarski pregled 1/2007 70,71p. 13. Socransky SS., Haffajee AD. Microbiology of periodontal disease. In: Lindhe J. Clinical periodontology and implant dentistry. 4 ed. 2003, 106- 149.